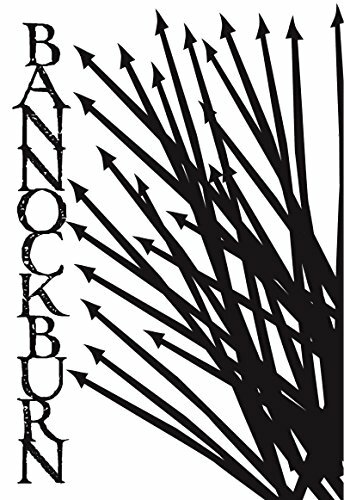 2014 is the 700th anniversary of the Battle of Bannockburn. Bannockburn Live was put on to remember the event. This is my personal review of the day. The Battle of Bannockburn is a major point in history for the Scottish and the English. It was the battle that Scottish King Robert the Bruce defeated England’s King Edward II. It took place between June 23 and 24, 1314, and this year was the 700th anniversary. Since the days were Monday and Tuesday, the event was put on this weekend just gone. It was called Bannockburn Live, and included delicious food, great music and wonderful speeches, as well as a full re-enactment of the battle. We decided at the last minute to go to Bannockburn Live, but I don't think that made a difference. We decided to go at the very last minute. It was Friday night, and we had just realized that something was happening. There and then, we decided it was worth going and would be a great family day out on the Sunday. At £20 per person, we really expected it to be full of interesting stories, something for the whole family and crafts that we could do while there. That’s what is seemed like from the website anyway. In the end, I admit that we were disappointed. There were a few parts that were our own fault, but some was to do with the organization of the event. There were three battle re-enactments during the day. We really should have opted for the first one at noon, but at the time our daughter was playing up and we didn’t think we’d get to see it all. In the end, we made a big mistake. The next session had queues around the park to get in, and then final one at 4pm had people queuing from the 2pm session! In the end, we didn’t get to see the battle re-enactment. That wouldn’t have been too bad if it wasn’t for a lot going on in the encampment area. It wasn’t just about the battle, but about discussing the battle strategies from the Scots and English. There seemed to be crafts for children too, and we missed out on a lot. We came home very disappointed, but part of it was our own fault for not going when the queue was at its shortest at noon. We should have known the queues would be long for the other two sessions. Some of the problems were down to the organization though. Really, the tickets should have had a session printed on them. It would have meant people knew they were only guaranteed to get in if they went at the exact time on their ticket. Failing that, having some of the discussions outside of the encampment area, and more things for children to do elsewhere would have been interesting. There was nothing for children younger than five, in reality, which made the day difficult. Except for a puppet show right at the start of the day, there was really nothing for smaller children to do. It was set up for those who were 5-years or older, with more emphasis for adults especially in the areas outside the encampment section. We never saw the encampments, but there were a lot of excited children coming out of it, so I can only presume something was there. There was a garden party style section with face painting. I don’t like face paint, and didn’t want my daughter getting it done (my sister and I are allergic to it and I’m not too sure about my daughter). But she did have some fun with the giant games. The only problem is she’s at the stage of throwing tantrums if she doesn’t get her own way, and she tries to join in when people don’t really want her to. There were moments where we had to rush to stop her picking up a giant checker piece while two children were having fun. With it being in a field, the event organizers advised people not to take buggies. Thinking it was going to be muddy and boggy, we decided to follow that advice, but I really wish we didn’t. The whole day would have been much better having a buggy for our daughter to be pushed around in. She could have happily slept in that, and we may have even waited for the battle re-enactment! There was no need for the organizers to advise against taking buggies, which really annoyed us. The Battle of Bannockburn marked a key turning point in Scottish history. Its 700th anniversary is in 2014. Robert the Bruce forged freedom for Scotland. The Fate of a nation was decided at Bannockburn. Yet 700 years ago, Scotland's most famous battle for freedom nearly wasn't fought at all. At Midsummer 1314, the scene was set for one of Britain's most historic clashes. The English fatally under-estimated the Scots, in their struggle for independence. The final day at Bannockburn is the one that's gone down in history. 700 years ago, Robert the Bruce cried 'Freedom' for his Scots on that famous battlefield. We expected much more from the craft village. Unless you wanted to go and spend a fortune on handmade crafts, the village was really disappointing. I was expecting small, handmade items that were linked to the Battle of Bannockburn in some way. I also expected some things for the kids to do. In the end, it was 10 or so stalls of companies based around the area. They showed off their craft products, including silver jewelry and woodwork made from whisky barrels. Don’t get me wrong, the items looked great, but they just weren’t what I expected based on the website. My daughter loved the puppet dragon. Just a handful of things saved the day from being a complete disaster. We loved the farmer’s market. As expected, this was a range of produce from the local stores within a tent. There were seafood stores, places selling homemade salad dressings, authentic Scottish tablet and even curries! Some were sold out by the time we looked around an hour into the day, but many others had plenty of stuff throughout. It goes to show the popularity of certain items, and those that knew they were going to be popular so stocked up. By the end of the day, the stalls had pretty much completely sold out. I’m not surprised either. We missed out on some lemon and black pepper fudge (it was delicious!) but we did get some gorgeous salad dressings, my husband got some tablet and my daughter got some delicious cookies. The music was the second part that saved the day. It was a range of styles, including folk music and rock. As with any music, my daughter loved dancing away. With it being in a field, she was also able to run around without annoying people, and we could sit down without doing too much chasing around. There were a few moments where she went to sit with a group of children or tried playing football with them, but most of the time she just wanted to dance and run around—and I couldn’t blame her. The food there was also delicious, and not overly priced. Even the drinks were reasonable, especially the alcohol! We expected it to be London Olympic prices, which were around £8 a pint, but we ended up paying normal Scottish prices! The places would have made a killing when it came to finances though because most ended up sold out and there were queues out the door. Another part that helped save it was the story time village. This was where the puppet show was, and there were other talks throughout the day. While our daughter needed a nap, we decided to sit in on a talk about “dark tourism,” which my husband and I found really interesting—you can probably tell that our daughter didn’t and decided to sleep on my knee for the whole 40 minutes. But that was the main reason we went. There were others we would have liked to have seen later in the day, but we ended up leaving early because we were fed up with a naughty little girl not getting to do as much as she wanted—and there just wasn’t enough for her to keep her entertained. For adults, and especially one interested in history, the day was extremely interesting. Many of the talks surrounded some of the lesser talked-about aspects of tourism, Bannockburn and the clan families. My husband was disappointed that his clan wasn't there, but then realized that they probably chose not to turn up on the day 700 years ago! There was a chance to meet a number of historians and authors. Alistair Moffat was signing books just as we were leaving, and I had the chance to hear him speak briefly. Unfortunately, it was at the point in the day when moods were low because of everything else had happened. I would have loved to have heard him speak in full and have him sign a book...next time! And I will make sure there is a next time. There was plenty on for adults, and most of the day was created for grown-ups. Even some of the story-telling was for adults rather than children. In conclusion, there are things we could have done differently, but there are things the organizers could have done differently. 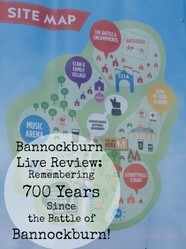 The idea of Bannockburn Live was great, and we were really looking forward to it. Unfortunately, our expectations were too high. It could have been organized better to get into the re-enactments (but we take some of the blame because we should have gone to the first one when we had the chance). There needed to be more on for smaller children around the storyville area. That really didn’t help our tantrum-throwing two-year-old, and next time we will take the buggy no matter what the advice is. We happily take some of the responsibility for the disappointment. But we weren't the only people disappointed due to the poorly structured encampment area and timings. There were some people stating they were going to get their money back because they had missed out on the battle re-enactments. The farmer’s market and the music really saved the day from being a complete disaster. If we’d have gotten into the battle re-enactment area it may have been different, but the day wasn’t worth the price of the ticket. Certainly, when one attends something with small children there is a risk of disappointment. However, as an adult I would have enjoyed the historians' accounts. But, maybe that is a subject for a television documentary. You're welcome. No point writing something when there's already a great piece (or four) online. I'm sure you would have. Without the wee one it might not have been so bad. There were a lot of talks for adults, and some great book signings and talks. Next time something like this happens though, we know to have the buggy if we still have one too young to handle a full day like that. PS Thanks for linking my history articles! I watched the television programme, and I enjoyed it as history. But I would not enjoy a memorial of a battle, even if the result had be. Likeen different. Likewise, I do not rejoice in any English victory over the Scots. For me battle anniversaries should be occasions of solemn reflection and reconciliation. Still, this was a well-written, well-balanced review. We caught part of a programme last night and it was really interesting. Don't think we'd have had to see the re-enactment after watching the programme since it went into so much depth of the first day. We live just outside of Glasgow at the moment, about 30 miles from Stirling (the area). It is a beautiful part of the country. I'm originally from England though, but my husband is originally from Dundee. It's a bit of a joke in our family since we married on the anniversary of the Battle of Flodden, another big England-Scotland battle. Watched the TV show about the battle, good prog. and your article gives me a different look at the events of the day. Pity it wasn't as good as hoped, but often these reconstructions leave one disappointed. I take it you come from that area? Lovely part of the country.